Elizabeth Burns: Diana Magnuson: The Interview! Diana Magnuson's snowflake was highlighted in the beginning of November. 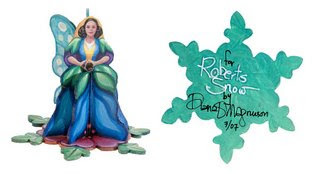 For more information on the snowflake auction, Robert's Snow, go here. Diana agreed to an interview, so here is some additional insight into Diana's work, her process, and her snowflake. She reveals what the faerie is holding; and she gives the best answer, ever, to my stock question: what is your pop culture area of expertise! Diana: Gennady Spirin inspired me. The Russian trained artists have amazing compositions. Diana: They contacted my online writers/illustrators group (PicBookArts) and asked for volunteers. Diana: I wanted to do something 3-dimensional and love drawing fairies, elves, trolls...and stuck an earring of mine on there as I lost the other one. Liz B: Could you tell us something about your most recent book, Home on the Range? Diana: It hasn't really got a strong story line as it's an American heritage song. I had photos from Dayton Hyde's ranch in the Dakotas that rescues mustangs for the background. He actually grew up in our house by Lake Superior. He's a writer. The illustrations show a non-traditional family on a cattle drive. It's quite subtle but the little boy is learning to ride throughout. Liz B: I also blog about pop culture. What is your "pop culture" area of expertise? Purty! I'm such a sucker for fairies. Excellent. Glad to know what the fairy's holding. Thanks, Liz! Wow. What a gorgeous sculpture!